Why do some people hear voices that aren’t really there? One of the most common symptoms of schizophrenia and other psychotic disorders involves auditory hallucinations. This occurs when someone hears sounds that have no basis in external reality. People can hear voices talking to them—sometimes a single voice, sometimes an entire chorus of voices. The voices can maintain an ongoing commentary on the person’s behavior, can make derogatory statements, call the person names, or even instruct the person on what to do. The most elaborate auditory hallucinations are associated with schizophrenia. Researchers have found that the auditory cortex is active when a person is hearing voices. In this way the brain actually is hearing voices although the sensory information does not come from the ear but from inside the person’s brain. It is believed that hallucinatory voices actually derive from the person’s thoughts. The thoughts get translated into a kind of inner speech, which the brain hears as if it were hearing actual speech. While inner speech is a common phenomenon, healthy brains can distinguish between inner speech and spoken words. In psychosis, however, the distinction between inner and outer reality is lost. For reasons we do not fully understand, antipsychotic medication restores the ability to make the critical distinction between imagined and external reality. 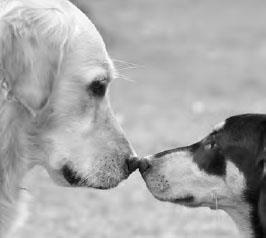 Animals such as dogs have a much more heightened sense of smell than humans, whose olfactory bulbs are correspondingly smaller and process less information (iStock).